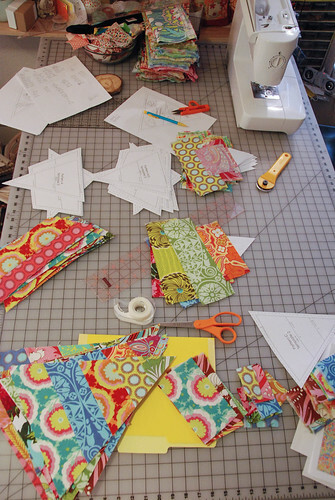 Since Friday I have finished 2 quilts (the quilting & binding) and started one more. While I can't show you the finished ones until after Christmas, I can show you the one that I worked on furiously from Monday night to Wednesday evening. 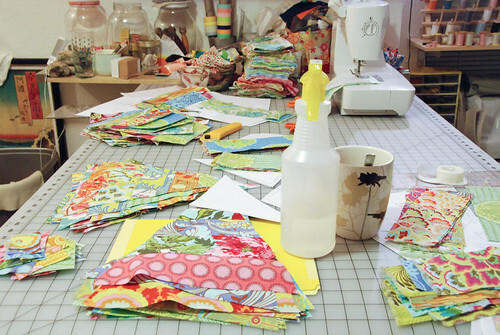 I enjoy how messy my table got mid-project. 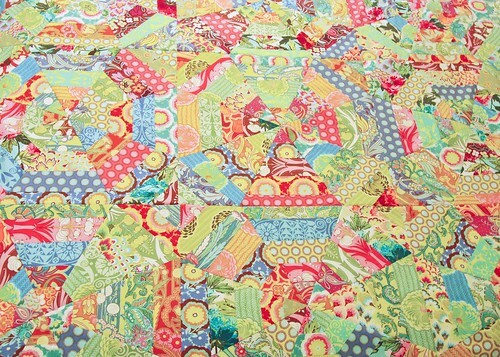 This is the Amy Butler Sunshine quilt. Let me tell you a bit about it! Colors are a bit off, but this is the best that I could get. It just covers the top of a queen bed. 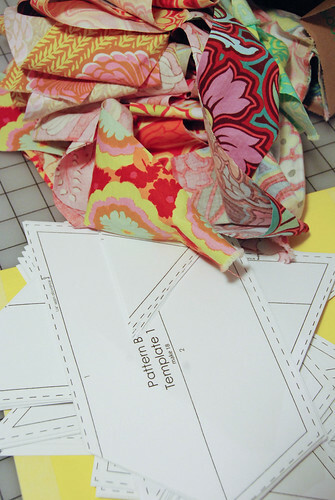 1) I used 33 FQs (one of each print) and it was enough. I have a little left over. The 1/2 yard of each that she says in the pattern is RIDICULOUS! Jeez, waste of fabric and very expensive! Just cut the 3.5" strips like she says (I also cut one 3" strip from each fabric to again reduce waste because some of the pieces are narrower). You'll have to measure a bit more for the widths, but it doesn't really take that much longer. 3) On pieces A 1 and A(r) 1 I put the larger strip at the bottom down first, then the smaller triangle tip. This is reverse order from what the pattern says, but it was a lot easier to work with. 4) Double stick tape is your friend. I ironed over it and it still peeled off the fabric at the end without leaving residue. 5) I sewed together all the Cs and As, and all of the B and A(r)s. Pressed the seams toward the As. 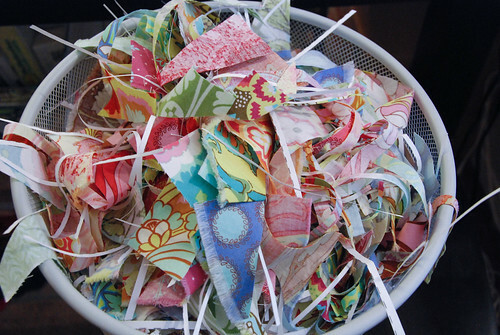 Then sewed those together, pressed seams toward the Bs. Then sewed the 2 halves together. It has grown on me. I wasn't a huge fan of the collection or design at first. 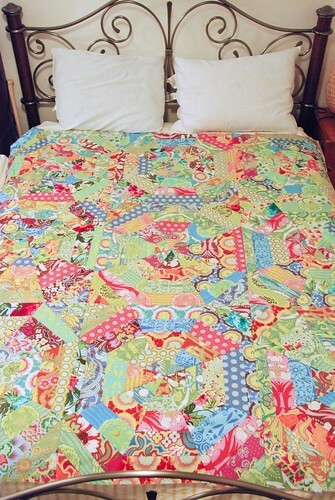 I like a few prints from the collection now, but I still think the quilt was a bit fussy for the look. It will be hung at Hip Stitch to promote the class and Soul Blossoms. it's gorgeous!!! Wow... I love this design. That is GORGEOUS! I think I now *need* one!